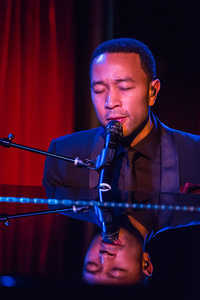 John Roger Stephens (born December 28, 1978), known professionally as John Legend, is an American singer, songwriter, and musician. He has won ten Grammy Awards, one Golden Globe Award, and one Academy Award. In 2007, Legend received the Hal David Starlight Award from the Songwriters Hall of Fame. Prior to the release of Legend's debut album, his career gained momentum through a series of successful collaborations with already established artists. He sang in Magnetic Man's "Getting Nowhere," Kanye West's "All of the Lights", on Slum Village's "Selfish", and Dilated Peoples' "This Way". Other artists included Jay Z's "Encore", and he sang backing vocals on Alicia Keys' 2003 song "You Don't Know My Name", the Kanye West remix of Britney Spears' "Me Against the Music", and Fort Minor's "High Road". Legend played piano on Lauryn Hill's "Everything Is Everything". He has gained chart topping hits from his solo work as well, including the Billboard Hot 100 number-one single, "All of Me". He won the Academy Award for Best Original Song in 2015 for writing the song "Glory" from the film Selma. • 'The Voice' Live Cross Battles: How will they work? How long will they last? Get all the details! • 'The Voice' recap: Nine artists advance in Battles including Andrew Sevener, Abby Kasch and Jacob Maxwell! This webpage uses material from the Wikipedia article "John_Legend" and is licensed under the GNU Free Documentation License. Reality TV World is not responsible for any errors or omissions the Wikipedia article may contain.